The winner from each age category will receive a $500 cash prize, with the overall winner receiving an additional $500 as well as a front of the line pass for America's Got Talent, The Voice, American Idol and/or NBC's Little Big Shots! Overall winner also receives a video of his or her live performance and extensive online and offline media coverage. There will be many other prizes donated by participating sponsors. 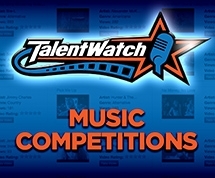 Competition is open to singers and bands. All genres are welcome. There are 2 phases to the competition. See Rules. The winner from each age category will receive a $500 cash prize, with the overall winner receiving an additional $500 as well as a front of the line pass for America's Got Talent! Overall winner also receives professional video of his or her live performance and extensive online and offline media coverage. There will be many other prizes donated by participating sponsors.